A few months ago, out of a sudden, a PSSS (Philippine Ship Spotters Society) member espied a ship docked in Hilongos port. Even though it was dark he was able to recognize the silhouette since he has already sailed with it in crossing Surigao Strait. It was a surprise to the PSSS community since many thought she was already dead since it has been three years since she disappeared from the Liloan-Lipata route. The last that was heard of her was that she was in a General Santos City shipyard. That time the new FastCats of Archipelago Philippines Ferries were also due to arrive (and it did) and so they have no more need for their old and unreliable Maharlika ferries. In fact, they were also disposing off already their Grandstar RORO ferries which was even a later acquisition of theirs from Phil-Nippon Kyoei. 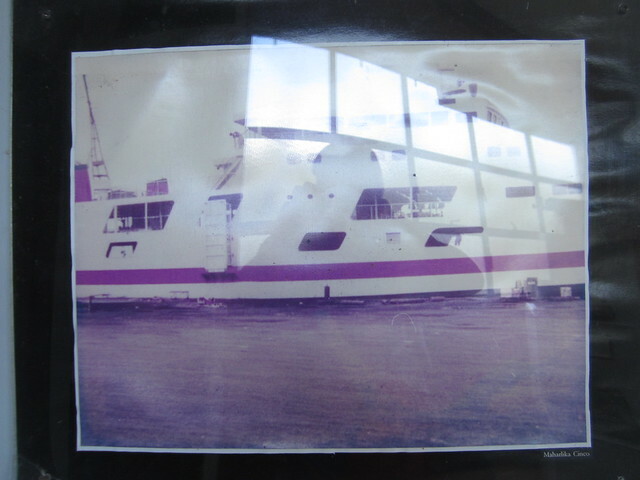 The ferry was the Maharlika Cinco which has long held the Liloan-Lipata ferry route for Archipelago Philippine Ferries. She was actually their most reliable ferry in the route, she was always there as if she had never heard of the two-year rule for mandatory drydocking. Maharlika Dos might be in and out of service like Millennium Uno but Maharlika Cinco will always be there. If one who doesn’t know her will think she is just another bland ferry then maybe he will be surprised if he will know that this ferry has a colorful history. Maharlika Cinco had actually bounced between routes and owners, has had a trip to the seabed, had her superstructure ripped, etc. Her bounces were actually too fast that international maritime databases has a hard time catching up with her thus it has lots of errors. This ferry was first known as the Sata Maru No. 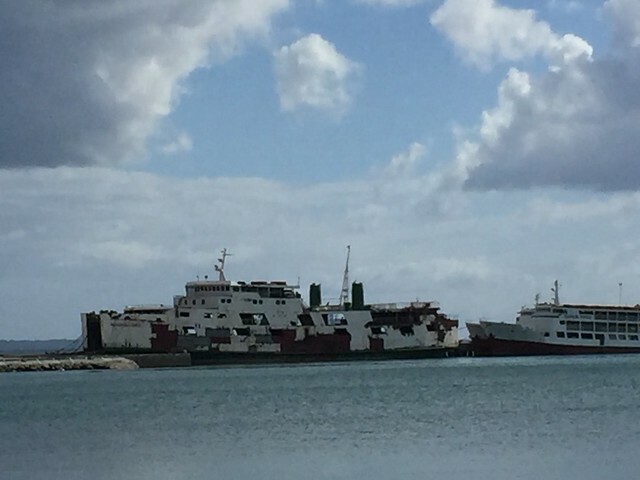 3 of Kinkowan Ferry KK and home ported in Kagoshima, Japan. She was supposed to be built by Mitsubishi Heavy Industries in Kobe, Japan but instead she was subcontracted to a shipbuilder that was not well-known, the Tokushima Sangyo in Komatsushima, Japan. Her keel was laid in November 1971 and she was launched in April 1972. She possessed the permanent ID IMO 7205221. The ship is a RORO with ramps at the bow and at the stern. She measures 70.9 meters in length over-all (LOA) with a beam of 12.5 meters and a load capacity of 500 deadweight tons. Her original gross register tonnage (GRT) was 997 tons. She has a raked stem, a transom stern with two masts and two side funnels. Sata Maru No. 3 was equipped with two Niigata diesels with a total of 2,600 horsepower giving her a top speed of 14 knots when new. In 1981, when Kinkowan Ferry quit operation she went to Nankai Yusen KK. A few years later she was sold to Badjao Navigation in the Philippines and she became the Christ The Saviour. Badjao Navigation had a route from Cebu to Samar among others but it was not really successful. Maybe like Newport Shipping that had a route from Manila to Samar she thought that it would be better if they will do a Matnog-Allen route which was growing then. By this time she was already known as the Christ The King. However, ROROs in the route multiplied fast. In time, Badjao Navigation quit the shipping business and she passed on to Luzvimin Ferry Services of the Philtranco Service Enterprises Inc. (PSEI), an intermodal bus operator with routes from Manila to Visayas and up to Mindanao where she became the Luzvimin Primo. Maybe when Badjao Navigation was still doing the Matnog-Allen route she was just under Provisional Authority (PA) because soon after Luzvimin Ferry Services started operations the ruling shipping company of San Bernardino Strait protested, the Bicolandia Shipping Lines, and pointed out that her competitor has no Certificate of Public Conveyance (CPC) or franchise. Luzvimin Ferry Services defended itself by saying that their ferries were just meant to carry their buses. The case was first heard in MARINA, the local maritime regulatory body which has quasi-judicial powers but eventually it reached the courts (the higher court even) which held that any ship transporting vehicles must secure a franchise from MARINA. 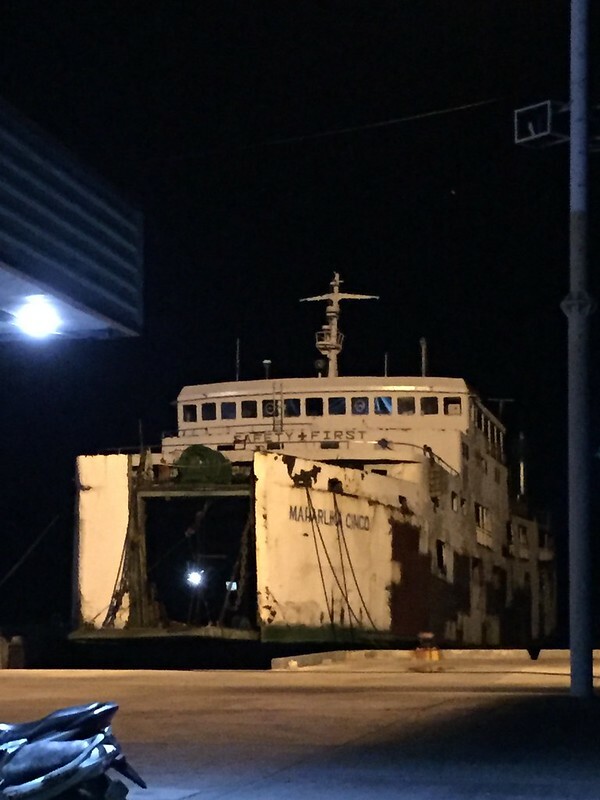 And that was the end of Luzvimin Ferry Services and the career of the former Badjao Navigation ferries in San Bernardino Strait. In about 1990, Christ The King next found itself in Batangas under a new company, the Prince Valiant Navigation where she was known as the Mindoro Express. When she went to that new area there was also a ruling shipping company there which was even tougher in challenging newcomers and sometimes the challenge is even outside the legal plane. I don’t know exactly why but soon she was doing a route to Palawan. There she sank in Honda Bay near Puerto Princesa port. 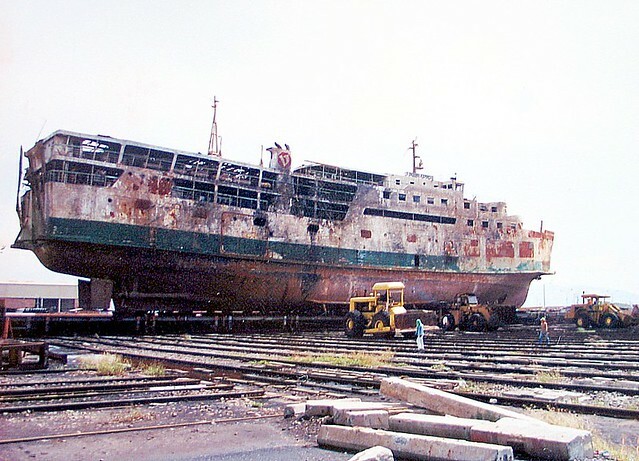 It turned out she was eventually refloated and brought to Keppel Batangas shipyard where a shipping owner who later became a PSSS member caught her in cam. This was in late 1991. From his analysis, he thinks the sooty exterior in the starboard side indicated the ship had a fire. He says firefighting water on just one side of a ship can capsize a ship. The ship bore other damages too like a missing port funnel and deformations in the structure. 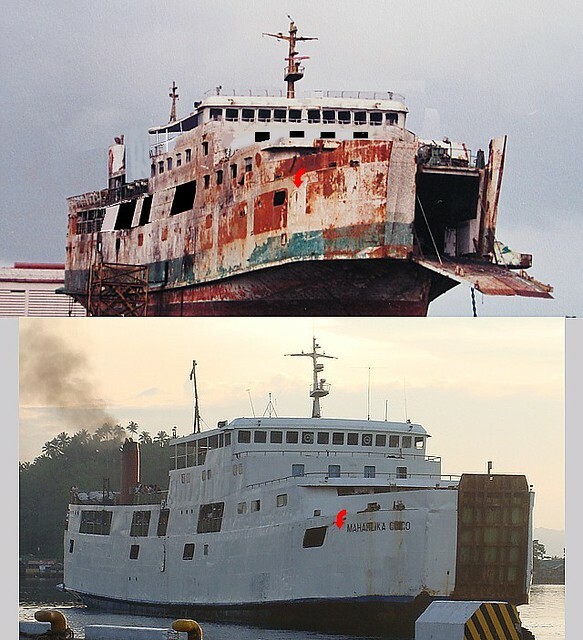 Much later, sometime about 2002, a ferry for Archipelago Philippine Ferries turned up in the Liloan-Lipata route to double their unreliable 18-year old Maharlika II. The name of the ship was Maharlika V. To almost everyone including me they thought this was just another ferry that just arrived from Japan. It seems even Philtranco bus drivers did not recognize her (or they were playing poker?). One thing though is she seems a little rusty but I think nobody thought much of it since being a bit rusty was an Archipelago Philippine Ferries trademark. And maybe nobody gave a damn as long as the ship was reliable. After all, the Liloan-Lipata route was home to unreliable ferries until Super Shuttle Ferry 5 appeared on the route. Fast forward to December 2008, the Philippine Ship Spotters Society (PSSS) was born. With its growing photostream from the members’ contribution, it afforded members (and the world) a view of the different ships from all over the Philippines from ferries to freighters to tankers and tugs and everything in between. A member then contributed a photo of Maharlika Cinco when their family had a vacation in Southern Leyte and they crossed Surigao Strait. That was 2009. It was here that the PSSS member who caught a photo of Mindoro Express in Keppel Batangas in 1991 realized that if the superstructure of Mindoro Express is cropped then it would look almost exactly the same as Maharlika Cinco and he alerted me. When a collage of the two was posted in PSSS the riddle of Maharlika Cinco‘s origin was solved. The two were exactly the same ship. Later, upon researching, the two ships had identical IMO Numbers and that was the final confirmation since IMO Numbers are unique numbers and only one hull can possess a particular number. Maharlika Cinco continued sailing but in this decade her engines were already beginning to get less reliable. Not soon after she disappeared from the route with the last news saying she was in a General Santos shipyard with an uncertain return. 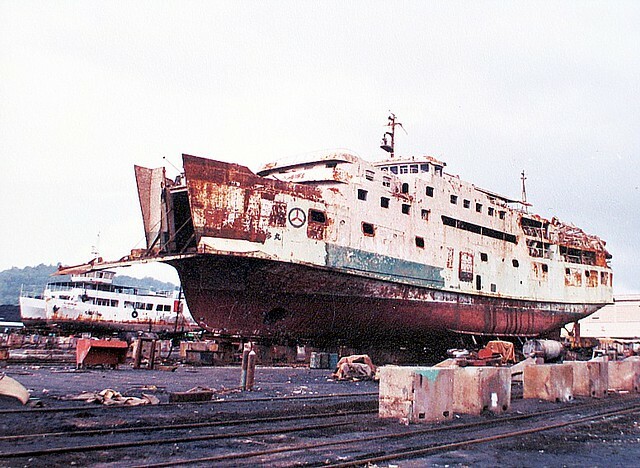 With Maharlika Cuatro and a rejuvenated Maharlika Dos (she was regenerated when her sister ship Maharlika Uno went to the breakers), it looked like Archipelago had no more use for her. To me, I no longer expected to see her again. Her metal before she disappeared also seemed to be on the soft side already. Soft metal plus unreliable engines plus no more use to me looked like equal to goodbye. It was like waking to a stupor when somebody called me from Hilongos to report that discovery of an apparition of a ship in the night. The PSSS member then proceeded to investigate. She would be the Gloria V of Gabisan Shipping which has a Hilongos-Cebu route. Yes, it was a buy one, take one deal. They also acquired the Maharlika Cuatro which stopped operation in the aftermath of the Maharlika Dos sinking. He asked what was the former name of the ship. “Mindoro Express”, they said, as if they can fool the PSSS ship spotter (and our ship spotter laughed). Maybe they were ashamed to admit it was the Maharlika Cinco because Liloan is too near and the ship does not really have a sterling reputation there. They latter admitted a difficult sailing from General Santos City via Zamboanga (they were afraid of the rough waters in the eastern seaboard of Mindanao). The engines failed several times and they had to seek shelter and assistance. The trip took long but finally they made it to Hilongos in one piece. No, sorry, they would not honor a ship tour. It’s understandable. After some preliminary work, Maharlika Cinco disappeared from Hilongos. From checking, PSSS members said she was not in Tayud, the great shipyard row of Cebu (she is too big not to be noticed from offshore). Then she was discovered in Liloan municipal port. They would finish the refitting there. They brought it over there since in Hilongos she would often be forced to undock if a ship is coming. Gabisan Shipping intends to sail her in the Cebu-Hilongos route. They say one of the Gloria cruisers will be sold and the Maharlika Cuatro which is in Tayud is for sale. It seems even Gabisan Shipping, a staunch believer in cruisers is also getting aboard now in the RORO bandwagon to Leyte. After all the Cargo RORO and the other ROROs are making a killing. Speculation says she will be spruced up to be able to compete with the Graceful Stars of Roble Shipping. This is simply a ferry that wouldn’t die and I don’t know if she has a charm embedded in her hull. If she will survive now, I just hope the MARINA plan which is fanned by some politicians and columnists that 35-old ferries will be retired will not snuff out her life. Finally.